Over the last few years we have bumped in Sensei Glenn Riley 5th Dan on numerous occasions. From Nottingham to Edinburgh if we turn up on a training course, there is a fair chance that Glenn may be there. I am not sure if Glenn is stalking us or we are stalking Glenn? Glenn has attended many courses at York and Selby over the years when we have hosted senior instructors. Although we have never been in the same club or association, we have all shared a love of Shotokan Karate and a desire for self improvement. In 2011 Glenn took the big step to set up his own club in Stainbeck, Leeds. It is a big decision to take over responsibility as a club instructor, or the running of an existing club, but a massive step to start from scratch. Bex and I were very pleased to be asked by Glenn if we wanted to train with Sensei Randy Williams 6th Dan KUGB at a course on the 20th December. Williams Sensei taught Heian Shodan for the Junior grades and Gankaku for the senior grades. Over just a few months Sensei Glenn has developed a strong following and I was very impressed to see so many white and Orange Belts in attendance. It was also nice to see the course supported by Dan grades from across the region from Leeds to York. If you have a few minutes take a look at The Akashi Shotokan Karate Club website, if you have a little longer, give Glenn a bell and plan a trip to his dojo, it has a very spiritual atmosphere. Glenn thanks again for the invite and wishing all Akashi karateka a Happy New Year. You could hear (and almost feel) every punch and kick, even from the back row of the seating. Looking forward to some more great sessions with Sensei Nick and Matt in 2012, Osu! Above : The SSKC "Un-Official Photo"
Take a look in the gallery section to see the official SSKC Christmas photo. I don't know how but someone has appeared in the shot who is not yet a SSKC member, can you spot them? Below is a montage of the brilliant display you put on for family and friends. Rebecca and I are very proud of our members and their achievements in 2011. We look forward to developing our current members and hopefully expanding the club a little in 2012. Have a great Christmas and we look forward to seeing you all in 2012. Kakuyoku Shodan & Nidan by Yamaguichi Sensei 6th Dan. Roshu from the recent World Championships in Edinburugh. Meikyo Sandan from the IJKA England Hombu dojo at Whitchurch, Kato Sensei instructing. I have also uploaded a 54 min video of our World Technical Director. The video is posted in the "Shotokan Shihan" section, click on the button in the side bar, scroll down the list of Shotokan masters (alphabetical) and click on "Kagawa Shihan" to take you to his page. This video is excellent! Shihan-ni-rei! If you follow the link to my kata page and double click on the kata name, it will take you to the video of the kata selected. Click on the yellow buttons below to return to the "HOME" or sskc "Kata" pages. We are very pleased to announce a few changes for 2012, which we are sure will strengthen our club for the betterment of our karetaka. We will be offering training to anyone 6 years or over. This is a year younger than currently and is possible due to our proposed format. Training will be at Barlby High School, York Road, Barlby, Selby, North Yorkshire YO8 5JP on Sunday’s from 5.30pm and a Wednesday's from 6.30pm. Under 12 year old beginner’s will train for an hour and the older / more experienced karateka will train for 2 hours. At Barlby school we are fortunate that we can train in two adjacent dojo at the same time, so this is ideal for families of mixed ages / grades. Pee Wee Grades - Beginner to 10th Kyu - 6 to 11 years old with Sensei Rebecca. Youths and Adults - Beginner to Dan grades - 12 years to Adult with Sensei Paul. Adults - Beginner to Dan grades - Cadets and Adults with Sensei Paul. To enable us to prepare students for regular gradings students are encouraged to train twice a week for the full session. You will notice that we have increased the training time for a Wednesday to 2 hours. The club has increased its Hall hire times and costs so we can better prepare students for necessary continued development. All students are encouraged to train twice a week and from Jan 2012 there is a single fee and all students will have access to approx 9 sessions a month. A family of 2 will have access to 36 hours of training between them for £30, that is less than £1/hour! Look forward to the Christmas display, photo and presentation of the Trevor Jinks Cup on Sunday 18th December. We look forward to seeing you all in January and assisting in your preparation for gradings at the end of February 2012. We are determined to make it one of the biggest SSKC grading of all time. Yesterday Matt and myself travelled down the road to Grimsby to train with Sensei Steve Carless, JKS England Coach. Many thanks to Sensei Andrew and Jackie for the invitation and warm welcome. We knew we were in for another of what I can "pleasure and pain" sessions, we weren't to be dissappointed. As mid grades you are oftern to aware of what you want to achieve in the execution of a technique but never sure how to train to improve it. It is not enough to just repeat the technique over and over. The second half of the session was mainly focused on escapes from grabs but using standard karate techniques. He also referenced the kihon back to kata bunkai, so very much a thinking session as well as physically demanding. Sensei Steve also spoke about fluidity of movement and transition of direction and its application back into kata. Thanks again for the invite, SSKC would like to wish all Kaizen-No-Michi karateka a merry Christmas and we look forward to seeing a lot more of you in 2012, Osu! We all had a great day at the JKS Nationals, Sensei Fran, Ian, Bex, Paul and Abby. Scott and Charlotte also came down to Nottingham to support. Abby was very unfortunate to miss out on the medals achieving 4th place in a very competitive field. Abby travel all the way to Edinburgh in September to watch Sensei Bex in the World Championship, so she had a good idea what a big event would entail. Hopefully this is the start of Abby's competition career outside the SSKC Competition. Sensei Bex is now competing in the Senior 19 years and over events where the competition is of a very high standard. 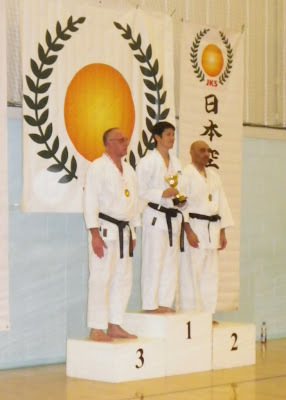 Bex also managed a 4th place in Individual kumite. 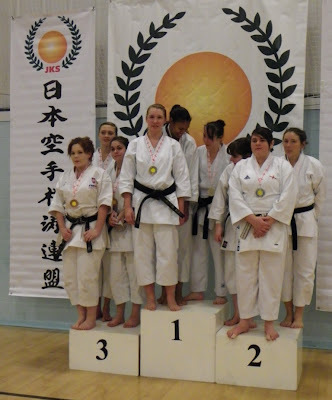 However she was very pleased with her first "big event" Gold Medal for 1st place in team Kumite. I had to do my bit as a table official most of the day but I was allowed time off for good behaviour to compete in the veterans kumite where I managed to gain a bronze medal for 3rd place. Many thanks to Scott and Charlotte for coming down to support us, they had such a good time that next time they will be part of the action rather than watching it. In 2012 there will be plenty of opportunity to take part in local, regional and National competitions, so follow the example of Fran, Ian and Abby and step onto the mat for a great day out and you might even come away with a medal or trophy.